Yoga has been a central part of Fiona’s life. She began learning Hatha yoga at age of 18 but became inspired by Kundalini Yoga and qualified as a teacher in 2003 in Ecuador, South America. She has been teaching yoga and meditation for 12 years. She holds IKYTA (International Kundalini Yoga Teachers Association) Levels, 1, 2 and 3. She is also on the Aquarian Academy of Teacher Trainers. Fiona has taught in Ecuador, UK and Sri Lanka. Coming from a corporate background as a London lawyer she realized how stress could be really controlled by the use of yogic techniques which were both scientific and sacred in their nature. As a result she has been running corporate yoga programs to help executives reduce stress and negative emotions whilst expanding creative problem solving. Fiona is fascinated in the link between quantum physics and yoga. In her classes you will get the experience of yoga and a meditative mind whilst intellectually understanding the benefits of practicing this ancient technology. Great emphasis is placed on learning to be present so we can learn to live in each moment and fulfill our potential. 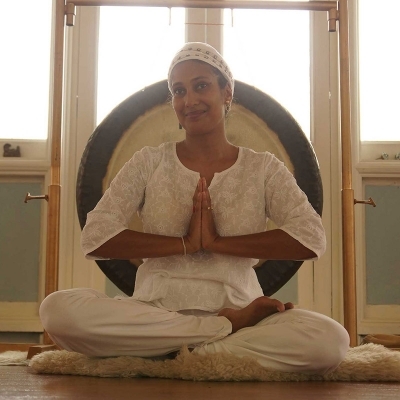 Music and mantra are an essential part of classes allowing people to connect to the rhythm center in their brain, the healing science of Naad, and use of the Gong, to free people from negative patterns that cannot be shifted. Fiona has a holistic approach to life; she is a healer and Reiki Master. Her philosophy is by understanding the self and learning emotional intelligence a person can free themselves to live a happy, healthy and fulfilled life.